There is something about the beatitudes – those “Blessed are the”…statements that Jesus makes at the beginning of the sermon on the Mount as reported by Matthew, something about them that get my creative juices flowing. Is that a good thing or a bad thing? Never too sure. But these simple yet profound sentences speak a world inverting truth that beg deeper exploration and that I find can be applied to different contexts. For the first wedding I officiated at as an ordained pastor, the couple picked the beatitudes as their gospel reading. So as the focal point of my homily, I adapted them into beatitudes for a loving couple. Of course there is that classic, irreverent scene from the Monty Python movie “Life of Brian” where we see some people attending that sermon on the mount who are stuck all the way in the back and can’t quite hear what Jesus is saying. Blessed are the peacemakers is heard as Blessed are the cheesemakers. And a debate breaks out as to why these dairy workers should be specially treated. So as we come to this familiar passage yet again, on this feast of All Saints, in a world overrun with disputing points of view, I can’t help but come up with various discussions and adaptations. Please keep your bulletin with the real beatitudes close at hand so that wherever I may stray down a path of ridiculousness, you might keep Jesus’ words before you. The tweet: What’s wrong with you who mourn – get over it. Righteousness? What’s righteousness? What’s it gonna get you? Hunger and thirst for success. The Merciful? You’ll get stepped on. The Pure in heart? You’ll see only heart ache. You Peacemakers? You’re wasting your time. You’ll only be called failures. And as for the persecuted? Fight back. Take revenge. Don’t let them see you as weak. Blessed are the rich in privilege, theirs is the power to exploit. Blessed are those who obliviously party hearty, they have the right idea. Blessed are those who are cocky and out spoken, they will get ahead and win. Blessed are those who are well fed on what the world has to offer, they can ignore the hungry. Blessed are the rough and tough, they will claw their way to the top. Blessed are those who manipulate the facts, they will persuade others to see it their way. Blessed are those who strike hard at their opponents, they will win, whatever the cost. Blessed are those who persecute the marginalized, and vilify scapegoats, they will recruit others to join the attack. But this is not who we are and it is not who we are called to be as children of God, as sinners who are also saints – the holy ones of God, made new in baptism, fed at the table, walking in faith, renewed by grace and living in the eternal hope that is ours through Christ Jesus. The Spirit is not at work among us and through us for the sake of self service and earthly reward. We are poor in spirit – if we are opening our ears and our hearts to him then we have already admitted that we are in need, we are wounded. As some have said – we have a Jesus sized hole that needs to be filled. We become rich not by our doing, but by God’s gift of the eternal kingdom that Jesus comes proclaiming and ushering us into. We mourn – yet again this past week has shown us the violence of our world, right down the street from here, this time. History teaches us that revenge is not the answer, nor does it satisfy our desire or comfort us in anyway. God is our comfort. The hope that is ours in Christ is our comfort. A hope that anchors us through all storms. A hope that is ours even when we are not feeling its comfort and its peace. We are meek – if we are wise, we will see that ultimately we are powerless. And thus we cannot take the earth. In our humility we see that God has given us all that there is, all that wee need. Our meekness leads us into wise and thankful stewardship, deeper gratitude, and more generous spirits. Jesus follows this short analysis of who we are, with what we are called to be as children of God, as saints who are sinners. We are called to hunger and thirst for righteousness – also known as a right relationship with God. Not just desire it or strive for it, but hunger and thirst for it, knowing that it will fill and satisfy us like nothing else will. God’s gift of grace through faith that will satisfy us. We are called to be merciful. Life teaches that this is one instance where it is more blessed to receive than to give; so wouldn’t we want to give mercy to others so that they might know that blessing. With pure hearts we see God is present. And as Jesus will teach as his last lesson in Matthew, we see the presence of God when we look with love on the other. And we are called to be peacemakers. Not necessarily at the UN, or in some distant lands, but in our own lives, in our own families and circle of friends – through forgiveness, and patience, and understanding, we make peace, we are doing the work of God as God’s children. Finally, having heard who we are, and who we are called to be, Jesus delivers the “now a warning” statement. This broken and sinful world stands in opposition to all this. And the voices and the powers, will not be silenced easily or give up without a fight. Sometimes the worst persecution for living into God’s blessings comes from the voices within us – voices that speak to us of unworthiness and shame. But nothing will take away what God is giving to us. And when, with the help of the Holy Spirit we live into this identity of saint, then we are being the salt and light this world to desperately needs. So, loved by compassionate Jesus sitting among us teaching and leading, we embrace all that we are – saintly sinners and sinning saints. And following courageous Jesus, we strive for all that he is calling us to be. 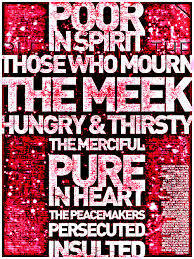 And in it all we will be blessed – keeping in mind that blessed in the Beatitudes can also be translated happy. For that is what God in Christ desires for all God’s children, for all saints, our happiness, for our joy to be complete. How truly blessed we are.